I've always felt the build quality with Porsche was much higher from the same era. This picture I found recently kind of proved it too me that VW is just a little sloppy when making convertibles, as compared to Porsche. They might have started out a little better than that. Sometimes things happen in transit. But as the young punk said after running into my car, "It's just a VW". I know it's a joke, but on a serious note, I recently started a pan off restoration on a 1956 Karmann Ghia and don't see a big difference in build quality between my Karmann B coupe and the Ghia. Same type of welds, maybe less use of lead so less tight seams. Methinks the cars were higher than the overpass. A big "OOPS!" They must have been tied down very well, I am impressed. Dan Epperly wrote: I know it's a joke, but on a serious note, I recently started a pan off restoration on a 1956 Karmann Ghia and don't see a big difference in build quality between my Karmann B coupe and the Ghia. Same type of welds, maybe less use of lead so less tight seams. Dan, that is a great car to have and restore! I have a '67 Ghia convertible so am familiar with their build quality too. They are very solid cars because they are coachbuilt cars just like the 356. My '63 Beetle on the other hand, well that's a whole different story. I love it to death, but no comparison to a coachbuilt car at all. Last edited by Sebastian Gaeta on Sun Nov 26, 2017 1:53 pm, edited 1 time in total. The cars were not too high the bridge was too low. Just imagine the mess if they had been sedans. Is that POLIS car a Dodge Dart? Close, its a Valiant. Not sure why they would have chosen that as a police car, but maybe it had a V8. It appears the driver made a serious error in judgement, and was not able to stop in time. It looks like the bridge height was at least a foot deficient. To stop there, I think the driver was well aware in advance, but not far enough in advance. In 1955 I attempted to buy a new VW. The car on the show room floor was beautiful, fit and finish. One had to put down a deposit of $100 and wait six months for delivery. I went next door to the "Sports Car" dealership and bought a Renault 4-CV. It was actually a good family car for my small kids. I have driven and restored both Porsches and VW's. Pre 1958 VW's had much better build quality than the later ones. 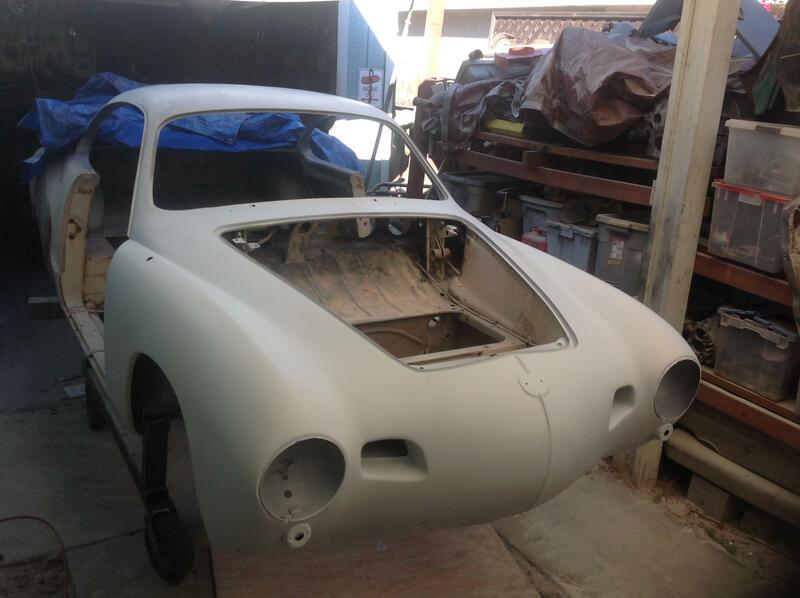 My 1956 Beetle has build quality that rivals my '60 Reutter bodied 356 coupe. I had a '62 Beetle convertible. It was a rust bucket like most of the Karmann cars I have owned, like a BMW 3.0Cs. I was very impressed by the build quality of a very early Porsche 912. It had all of the nice allen head screws, and it was primed and painted like they meant business. Jim Liberty wrote: In 1955 I attempted to buy a new VW. The car on the show room floor was beautiful, fit and finish. One had to put down a deposit of $100 and wait six months for delivery. I went next door to the "Sports Car" dealership and bought a Renault 4-CV. It was actually a good family car for my small kids. Jim, I can't believe how similar our situations were. The year was 1957 rather than '55, I was stationed at Plattsburgh AFB, NY and attempted to buy a new VW. Delivery time was too long then too so I went down the road a piece and bought a new Renault Dauphine (5-CV, I believe). Probably the same engine as in your 4-CV. Body a bit more streamlined. Quite possibly the worst car I ever owned, although it did survive two round trips cross country to California. Best thing about those engines was that you could stick in new pistons and cylinder sleeves and drive them another 50,000 miles. Ended up buying a used '59 VW in '62,after I was well into 356s. Wish I still owned it. It's my third KG project, did a 60 coupe, a 74 convertible and now this one. It's has all sorts of cool weird old stuff on it. It's pretty pricey to do correctly, almost as bad as a 356 but not near as much in resale value. I am building a vintage Okrasa engine for it, using big bore 80mm Pistons and cylinders, 69.5 stroker crank, original Okrasa duel port heads and intakes as well as original Solex 32 PBJs and a 010 distributor and Okrasa grind cam. I am using a later "doghouse" style oil cooler with the offset and a 36hp style shroud for better cooling. Also using a Fram bypass filter. Here's a pic of where it's at now, just finished doing rough bodywork and priming the front clip.